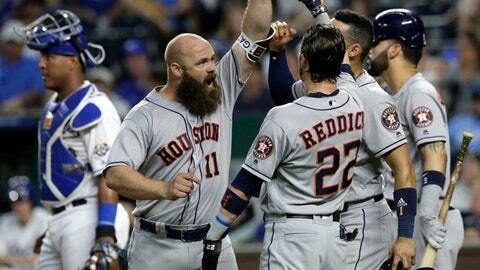 The Astros scored six runs on three home runs against Royals' starter Jakob Junis. KANSAS CITY – Houston Astros manager AJ Hinch watched his team load the bases in front of hot-hitting Evan Gattis, and all he wanted was the big designated hitter to send a drive to the outfield and keep the line moving. It cleared the bases, too. #Royals on the board as Moose drives in two! !